One definition of white noise: “Meaningless or distracting commotion, hubbub, or chatter”. White noise is also used to describe the intentional background sounds that help one sleep. Babies sleep better with a white noise generator humming. For many years, I had witnessed the racial tensions in the U.S.. I was concerned, caring, compassionate. I did my best to treat Black people in my life (there were a few) with utmost respect and sensitivity. Of course, I was righteously appalled by the KKK, white supremacists, neo-Nazis, and other alt-right racists. And I would be (silently) critical of any white person exhibiting racist attitudes or behaviors – when I could detect them. About 4 years ago I began to recognize all that goodwill and sensitivity as “white noise”, an elixir. I had to acknowledge that my caring, compassion, etc. did nothing to remedy the situation. These actually sustained me in a bystander status, blind to the subtle ways in which I was complicit in the very systems I said I abhorred. White noise. Sleep on. Author/researcher Dr. Robin DiAngelo (“What Does It Mean to be White?”) unpacks comments like these to reveal the combination of innocence, ignorance and denial they represent . All serve to blind us to the well-documented evidence of structural and institutional racism, and more importantly, our participation in their perpetuation. These statements also provide evidence of the myths and stereotypes we’ve absorbed simply by being alive and impressionable. Here is a stark learning that is helping me wake up: It is not possible to be non-racist! We are either racist or ANTI-racist! So many of us whites want to claim that we are not racist. This claim echoes among liberal white communities particularly. As long as the KKK, neo-Nazis etc. are the standard for being racist, we can excuse our failures to speak up, to advocate for changes in laws, policies, practices that are racist, to actively support political candidates who will pursue changes in laws and policies. ANTI-racist means active engagement, intentional involvement. ANTI-racist means being outspoken in our families, workplaces, neighborhoods. ANTI-racist means pro-actively seeking ways to become allies to Black-led initiatives, following their lead, their understanding, their convictions about what needs to be done. 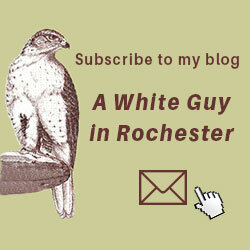 Reading this blog does not make one ANTI-racist. Only action can do that. This might be a good point to mention GUILT. The previous couple of paragraphs are intentionally provocative – provoking to action. A common white response would be to slide into guilt. Guilt is white noise! It’s like an internal repeating cycle: do nothing, feel guilty, wallow in the guilt; do nothing, feel guilty, wallow in the guilt, etc.. Guilt is harmful to the guilty since it is a state of dis-ease. More importantly it is harmful to minority communities because our inaction perpetuates the systemic, institutional practices that are literally life-and-death issues. You can scroll to the bottom of the page to “Leave a Reply”. Get a subscription to “Minority Reporter” at www.minorityreporter.net. This bi-weekly publication provides coverage of issues affecting minority groups in the Rochester area, as well as activities often not publicized in mainstream media. Howard, when I use the example of a “program” I further explain what that would look like. Yes, it is individual in that it requires educating ourselves and becoming aware of our privilege and biases. It especially requires the growth of humility on our parts to step back and not insist on being the leaders and to understand that we will never be the experts when it comes to racism. But the next part is the “program” I present is systemic interruption and change through action. And always speaking out and pointing out the racism present in most situations. If we do not do these things, we are still a practicing racist. The complete racism recovery package is educate, legislate, and agitate. All are necessary. And you never graduate. “Join Showing Up For Racial Justice (SURJ) Rochester . This is the local chapter of a national organization of white people who work as allies to the Black community. They regularly publicize events for education and for supporting Black-led efforts.” WHAT??? WHAT??? That’s their stated purpose, Howard, and I have seen that they do this. I don’t recall seeing publicity given there for the MAMA/TIDPC initiatives. I don’t know why. Have you had any exchanges with them about that? Frank, is your statement that you “have seen that they do this” — a reference to your apparent belief that “working as allies to the Black community” translates into simple, nearly irrelevant gestures — such as so-called “regularly publicizing events for Black-led efforts.” Is this your idea of so-called “working as allies to the Black community”??? I’m torn on this, Howard. I do see the issues the article mentions as critical ones. I also see SURJ at least locally re-examining its own accountability after some tough interactions. I’m watching to see what comes of it. And I’ll keep paying attention to your critique of it. Meanwhile, I do see it as the best example locally of white folks taking responsibility for their own education, pointing people to Black-led efforts, and creating valid accountability. Frank, you “have seen that they do” WHAT (SPECIFICALLY), WHEN, WHERE, AND HOW??? The only “exchanges [that I have had’ with them” entailed them responding to a request to add me to their Facebook page — only to delete me a few weeks later because I called them out on a position that they took regarding an issue involving racism, which they were not able to explain, nor defend — thus, they tried (unsuccessfully) to make a case that I was being unreasonable and disruptive. You know what happens when people can’t handle my critiques and analyses, e.g., they just attempt to shut me out. In this particular case, they used a black person to do it, that is, to delete me, and he attempted to explain why, but was unable to do so, and came close to attempting to threaten me. That’s what I “have seen that they do” — period. Frank, I unequivocally, categorically disagree that surj is “the best example locally of white folks taking responsibility for their own education, pointing people to Black-led efforts, and creating valid accountability.” I believe white people who work constantly and consistently with our Coalition are much, much better examples. The latter group don’t just TALK it — they WALK it. Well said. You either perpetrate it or you stop it from being perpetrated; failing to perpetuate it is nothing but complicit. So, which of the two choices are you engaged in? If it’s helping to “stop it from being perpetrated” — would you be so kind as to explain HOW (SPECIFICALLY)? I’m so aware that whatever I do will be inadequate. Still, I’m moving ahead with what seems to be my particular role right now – stirring other white folks to engagement, learning and action. Your Blog topic was very helpful to me. I need to declare myself “anti-racist” and judge my actions or non-action accordingly. It’s NOT possible to be anti-racist and an agent of “non-action.” That’s an oxymoron. The two are diametric-opposites.The compound term anti-racist is an action-term — verb. Thanks for these thoughts, Frank. I would add that all white people are racist using the accurate definition of racism. We (white people) can and should perform anti-racist actions, and we should work every day to unlearn racism, but I dont believe it’s possible for a white person at this point in time, in the US, to not be racist. Agreed. Thanks for stating that clearly, Erin. Thanks for weighing in, Wilma. That’s a great way to conceptualize it, Wilma. Thanks for sharing. I wish there were a 12 step program for white people to unlearn racism. Action is a fundamental requirement to change the racial and cultural barriers that exist. Institutional/Structural Racial change must be led by African-Americans with the support of Eurocentric people. (Separately, and related, I now try to avoid using a person’s skin color as the basis for racial designation. Eurocentric people must be also active in confronting personal, family, and neighbor barriers. Frank, I agree with the requirements to promote equality across all people. Mike, after your first sentence, I totally disagree with you. Structural racism is a system that was put in place by white men for their economic advantage. This puts the responsibility of changing it on their shoulders. Also we as white people have no business telling POC what they need to do. On a personal level we white people need to become more and more aware of our white privilege and the advantages it gives each one of us. We must see that meritocracy and the American dream only work for some of us and that is how it was meant to be. Then we must work like hell to change that. I added some comments, which haven’t been approved. Howard, I was without internet for a few days until this morning – so I was behind on approving. This post was quite a while back. I’ve observed more of SURJ since then, and my opinion about them is not so high.